The two sides met in last year’s All-Ireland final. 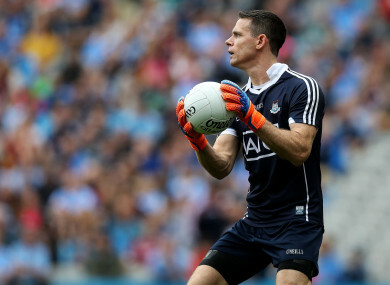 Stephen Cluxton drops out of the squad this afternoon. DUBLIN WELCOME BACK Evan Comerford between the sticks as Stephen Cluxton drops out of the team named to face Tyrone this Saturday evening [throw-in 7pm, Eir Sport]. Jack McCaffrey is the other high profile casualty to drop out of Jim Gavin’s side from their last outing against Roscommon. The reigning All Ireland champions still boast an experienced forward line, with Ciaran Kilkenny lining out at full-forward and the talismanic Cormac Costello in at centre forward. Brian Fenton continues his partnership with Darren Gavin in midfield, while Brian Howard, Cian O’Sullivan and John Small make up the half-back line. Dublin meet Mickey Harte’s side in a repeat of last year’s All Ireland final, having beaten them by six points in last year’s showpiece at Croke Park. Email “Cluxton and McCaffrey drop out as Dublin name team to face Tyrone”. Feedback on “Cluxton and McCaffrey drop out as Dublin name team to face Tyrone”.